Now Archived! PolarConnect event with Dave Jones and researcher Mike DeGrandpre from Montana discussing research aboard the CCGS Louis S. St-Laurent in the Beaufort Sea. You can access this and other events on the PolarConnect Archives site. 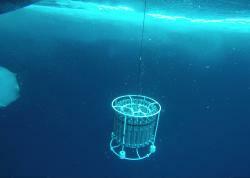 An underwater view of a CTD (conductivity, temperature, and depth instrument). Photo by Bill Schmoker. Global warming and other climate-related processes are rapidly changing the Arctic Ocean. The carbon cycle is of particular concern in the Arctic because it is unknown how carbon sources and sinks will change and whether these changes will lead to increased greenhouse gas accumulation in the atmosphere. Not much is known about the CO2 cycle in the central Arctic Ocean basins because nearly all measurements have been focused on the Arctic coasts during the low ice summer period. The team's contribution will be to collect shipboard CO2 data during these cruises and deploy CO2, pH and oxygen sensors on existing moorings in collaboration with Woods Hole Oceanographic Institution scientist Rick Krishfield. The Arctic Ocean is changing rapidly. The changes have important implications for global carbon cycling, global fisheries and ocean acidification. There are many intertwining processes, however, that make future predictions difficult. This project will make important contributions to our understanding of the global carbon cycle and ocean acidification by providing Arctic scientists with high quality carbon cycle data to use in model development and as a baseline for comparison with future carbon parameter measurements. The Canadian Ice Breaker CCGS Louis S. St-Laurent. Photo by Bill Schmoker. The team will be aboard the Canadian Ice Breaker CCGS Louis S. St-Laurent. The ship will come in and out of Kugluktuk, Nunavut in northern Canada. The ship's track will cover a portion of the Beaufort Shelf to the Mackenzie River outflow, then north into the Beaufort Sea and Canada Basin. The team will take commercial airline connections all the way to Kugluktuk. 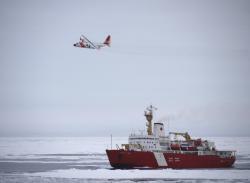 The CCGS Louis S. St-Laurent's helicopter then transports scientists to the ship anchored offshore of Kugluktuk. How Does Polar Ice Coverage Effect the Carbon Dioxide Concentration of Polar Water Bodies? Teacher Dave Jones and researcher Mike DeGrandpre present live from Montana discussing the research that took place for 4 weeks aboard the CCGS Louis S. St-Laurent looking at CO2 and pH Studies of the Arctic Ocean. A short newspaper article featuring PolarTREC teacher Dave Jones in the 8/8/2017 issue of the Missoulian! He will set sail on 9/6/2017 aboard the Canadian Ice Breaker CCGS Louis S. St-Laurent with researcher Mike DeGrandpre heading for the Beaufort Sea. Article from EOS Earth & Space Science News summarizing research linking gas exchange and sea ice extent in the Arctic. Dave has been a Chemistry teacher at Big Sky High School for twenty-some years and has served as the Science Department Co-Chair for more than a dozen years. Dave came to Big Sky High School with a B.S. in Zoology from Idaho State University (1986) and eventually earned a M.S. in Chemistry from the University of Montana (2000). He has been involved in several inquiry-based curriculum development projects and trainings. Most notable of these has been the Frameworks for Inquiry Chemistry Project with Dr. Mark Cracolice at The University of Montana Department of Chemistry and Biochemistry. Along with five other Chemistry teachers from around Montana, they developed a unique High School Inquiry Based Chemistry curriculum. Dave has also worked with the Center for Environmental Health Sciences at the University of Montana on air quality related projects designed to bring project based learning experiences to high school chemistry students. Dave received the 2009 Gustav Ohaus Award for Excellence in Science Teaching, the 2006 NSTA Vernier Technology Award, the 2005 Best Buy TEACH Award, and the 2005 ACS Division of Chemistry Education Northwest Region Teaching Excellence Award. Dave’s basic science teaching philosophy is that students learn science concepts best when they can relate concepts directly to data from experiments they conduct themselves. Dave is an avid climber, skier, and biker, and cannot bear the thought of spending his free time indoors. Mike DeGrandpre became fascinated with science and chemistry after ruining his mother’s card table with an incendiary chemical reaction at the age of 10. He enrolled in chemical engineering at Montana State University in 1981 and then went on to obtain a Ph.D. in analytical chemistry at the University of Washington in Seattle in 1990. His research at the University of Montana was focused on fiber optic-based chemical sensors. He used this knowledge as a post-doctoral scholar at Woods Hole Oceanographic Institution to develop a successful CO2 sensor (the “SAMI”) for marine applications. He came to the University of Montana in 1996, to, oddly enough, continue his ocean-focused research. The SAMI sensor technology has been a career-long endeavor, with the development and commercialization of related sensors while also using the sensors in aquatic environments, improving our understanding of the global carbon cycle and ocean acidification. His current research is focused on the Arctic Ocean carbon cycle and development of an autonomous alkalinity sensor.